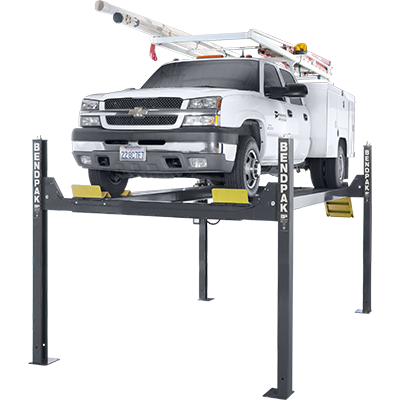 The industrial-quality HD-14T is a full-sized lifting force designed specifically for parking higher-profile vehicles beneath the raised platform. With this four-post lift, you can push 14,000 lbs. worth of automobile into the air without breaking a sweat. The HD-14T offers superior lifting power with an extended 82” rise, which means if we were a clothing warehouse, this car lift would be found in our “big and tall” section. Commercial fleets of trucks and vans will be right at home in your service bay with this model. Impress your customers by accommodating a wider variety than the competition, no matter what vehicles they bring in. Longer runways are necessary for heavy-duty lifts. This four-post lift boasts runways long enough to handle large trucks and SUVs. Plus, longer runways prevent damage to the vehicle; we also extend the approach ramps in order to protect the bottom-front of the chassis. BendPak cable sheaves are huge: 10.5” diameter sheaves and 2.25” diameter sheave axles, all kept within the runway and cross tubes. This cuts down on how much time and cash you have to spend on maintenance and general upkeep. Each BendPak lift in this series features four, 1/2” diameter, 6 x 25 stainless-steel lifting cables that have an incredible breaking strength of over 14,000 lbs. each. Grease fittings on the sheaves and sheave axles ensure proper lubrication for these critical parts. Keeping the runways level during rise is arguably the most important part of lifting a car. That’s why BendPak insists on upholding the best safety standards in the industry. The integrated flow restrictor ensures a slow, controlled descent in the very rare case of hydraulic hose failure. 10" x 12" base plates keep this four-post lift safe, stable and always ready for service. Automatic locks activate as the runways rise. Adjustable safety ladders make sure the ramps are level, even if there is a slight slope in the garage flooring. This incredibly useful safety precaution adds to the versatility of the lift. With the push of a button, a pneumatic (air-powered) lock release lets operators lower the lift with ease. Aircraft-quality stainless steel and aluminum pneumatic cylinders are the most durable and trouble-free you’re bound to find on a car lift. The all-important backup slack-cable detection system comes standard on this four-post lift (as well as every other lift we make). Others don’t have it. We refuse to leave you without it. Peace-of-mind is everything in the lifting business, so we give it in spades. Hidden internal components keep them protected from environmental damage, as well as human interference. Fully adjustable, multiple lock positions let you work at the height most convenient for you. Let the power system do the lifting while you worry about the work. A dependable, zero-maintenance system keeps all controls right at your fingertips. The runways of the HD-14T four-post lift grab your wheel securely, so when you put your vehicle in park and tell it to stay put, it stays put. The longer the approach ramp, the easier it is to load low-stance cars. High-clearance trucks and SUVs don’t usually have this concern, but we’re sure to keep your lift as versatile as possible. ALI-certified cable tubing protects against electric shocks. It also prevents wear and tear that occurs over time. Unprotected cables are a serious concern, and BendPak takes away the worry with our flexible, non-metallic tubing. We recommend the optional 7,000-lb. capacity rolling jack (model RJ-7), so you can perform wheel service on your lift. These frame-engaging jacks lift the vehicle off the four-post lift’s runway. Two jacks used together will let you raise all four wheels off the car lift at once!